You might think of a winter vegetable garden as only appropriate for those folks in the sun belt. But here at New Terra Farm (near Ottawa, 45-degrees latitude, zone 5A) we still have goodies growing as of November 1. Right now we have turnips, carrots, mesclun, arugula, spinach, and several other kinds of greens still growing, despite several frosts. We picked the last of the broccoli and cabbage yesterday. Plan your winter garden in the summer. We start planning the winter harvest season in late summer. For example the broccoli we harvested on October 31 was started from seed in mid-July, and planted in the garden around the first of September. Select the right crops. We can't grow tomatoes in November around here, but there are a dozen or so crops that will survive well in to winter. Eliot Coleman of 'New Organic Grower' fame makes a distinction between the 'growing season' and the 'harvest season'. For example, our broccoli did most of it's growing before heavy frosts set in. Then it remained mostly dormant, under cover (see next point) until we were ready to harvest. A little research should find you some crops that will survive in your climate. Use simple, cheap crop protection.We absolutely LOVE row cover for the winter garden. We 'cover up' once the weather turns real cold; I've observed that more plant damage seems to come from harsh winds rather than just cold. Row cover provides protection against both. Consider investing in a small greenhouse. My small (500 sq ft) movable greenhouse has produced thousands of dollars worth of veggies and bedding plants. A greenhouse this size can pay for itself the same season, and will really kick your winter vegetable garden into high gear. Now is the time to start planning your farm for next year, check out the resources at right to help you make 2011 a successful year in your garden . . . I'm a big fan of small greenhouses. 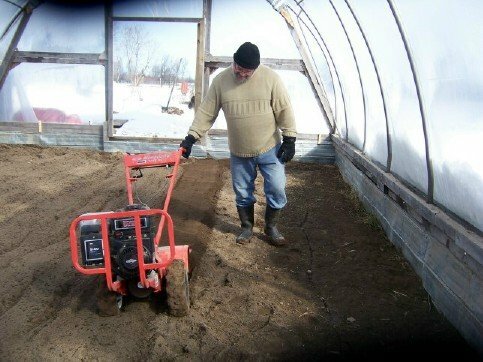 My greenhouses have more than paid me back for the time and money I spent in constructing them, and have made winter vegetable gardening much more practical. In my opinion, this is one of the first tasks a small farm should undertake.